Here are a few examples of helicopter charters and transfers we can do, please inquire for prices on any helicopter charter needs around Rio de Janeiro you may have. We can also connect you dirctly from/to your secret paradise with many major airports for your national or domestic flight connection. It is a peninsula with eight kilometers of extension and 23 beaches, receiving on one side maritime currents of the Equator and the other maritime currents of the south pole, which causes beaches to have both warm waters and cold waters. There is no place more emblematic than the Orla Bardot, this seaside boardwalk where you find the famous bronze statue of Brigitte Bardot, the movie actress who placed Búzios on the tourist map of Brazil. When she visited the city, in January of 1964, happening since then to be known like the Brazilian Saint-Tropez. Located in the region known as Green Coast, 155 kilometers from the city of Rio de Janeiro, amidst legends and tales, the true history of the city. 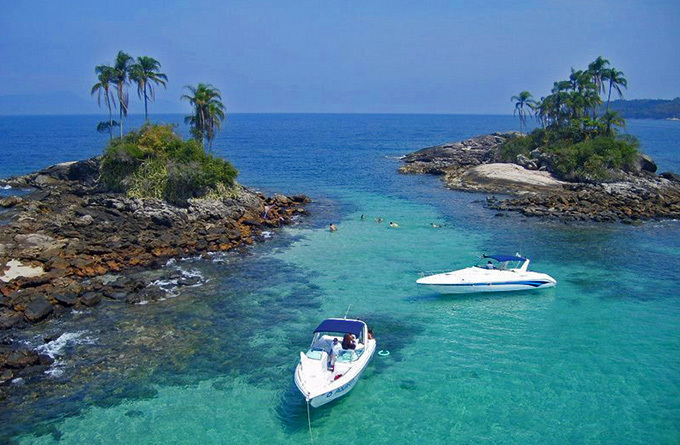 Angra is a magical place, from those where the imagination goes far and invites us to know how it all began. A beautiful colonial town, considered National Heritage, preserves until today its innumerable natural and architectural charms. In its area are the Serra da Bocaina National Park, the Cairuçú Environmental Protection Area, where is the Trindade Village, the Joatinga Reserve, and also limits the Serra do Mar State Park, is Tropical Forest on every side.